Ready to have Agency Arms upgrade your slide? The Urban edition is the lightest slide we do. It has three windows and is the fastest and flattest tracking configuration. *Slide Serration count will change depending on the length of the slide. The Hybrid edition has only one window on top of the slide and offers the best weight balance of the three configurations with an RMR installed. *Slide Serration count will change depending on the length of the slide. The Field edition has no windows and is designed for the utilitarian shooter. It features several enhancements without introducing windows. *Slide Serration count will change depending on the length of the slide. The Patrol Series was designed for a Law Enforcement contract. 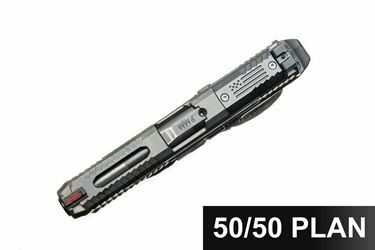 It features enhanced front serrations and an optional Optic cut all while keeping costs down. *Slide Serration count will change depending on the length of the slide.